Yes it is the franchise that just won’t die, no matter how much film lovers rant and rave over it or wish for its demise. But seriously who can blame the executive producers for keeping it going now that they have discovered that these dance films cost very little to make and thanks to teenage girls right around the world end up making hundreds of millions of dollars at the box office. 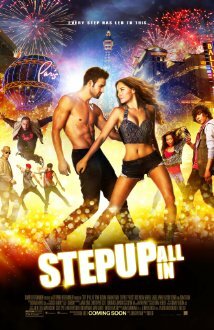 Step Up All In is supposed to be the All-Star Game of this franchise as the best characters/dancers from the previous films line up under the guidance of Sean (Ryan Guzman), Andie (Briana Evigan) and of course the lovable Moose (Adam Sevani) as they try to not only take out the prize offered by a reality show called The Vortex, but prove that dancing can be a fulltime job. Now I’m actually going to go in and bat for this film a little because despite some of this franchise’s clichéd, recycled storylines and one-dimensional characters creeping in the film does more than enough to please its demographic. The film’s dance sequences are spectacular (despite the fact we are led to believe the characters came up with the finale in just a few hours), and there is more than enough Guzman flesh to keep the teeny boppers happy. Step Up All In also take a fair swipe at reality television labelling it scripted and corrupt… so it needs to be congratulated for passing that message across to its’ audience. While the storyline revolving around television host Alexxa Brava was let down by Izabella Miko’s acting (was she trying to channel Lady Gaga and the crazy host from The Hunger Games?) at least it tried to make a good point, something that has been rare in Step Up films of the past. Of course I could also write an entire essay on the weakness of the cast’s acting abilities (is that Asian actress one of the worst actresses to ever hit the big screen???) but of course people don’t go see a Step Up movie to see a Shakespearian performance do they? They’re here for the dancing and that’s about it. Oh, and talking about the Step Up cast, if you’re wondering whether Channing Tatum decides to return to the franchise that made him a name, no he doesn’t, he obviously thinks he is above all this now. Step Up All In isn’t going to win any awards, but to its credit it also won’t bore its audience to death like some other dance movies have in the past. Now we just have to all sit back and watch as the producers once again count all the cash that comes in. Other Subculture Entertainment Reviews of ‘Step Up All In′: For our full Step Up All In review please check The Good The Bad The Ugly Film Show Ep #96 . You can also read Dave’s Step Up All In review on The Book The Film The T-Shirt.